When you’re filled up with the offerings from the buffet at your all-inclusive resort in Jamaica, start looking for a way to burn those calories off. Whatever type of outdoor recreation you fancy, you’ll find it near Montego Bay and Negril. And it’s hardly surprising, considering the inviting teal green sea, that many of the activities are water-centric. Being a landlubber, I’m generally content to admire from the shore, but the sparkling waves tempted even me. There truly is something for everyone here. If you’re craving a full-on adrenaline rush, cliff diving will deliver. If you’re content to view the ocean from above rather than under, try a sunset catamaran cruise. 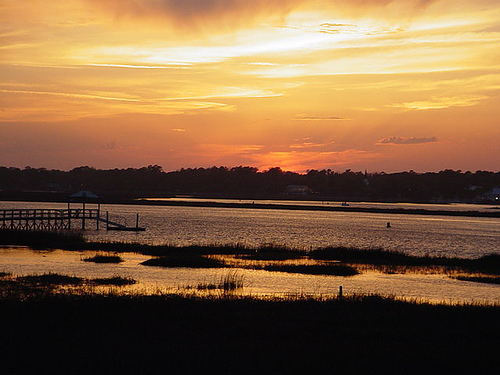 Water temperature is in the comfortable 80’s year-round, so there’s never a bad time to visit. Tip: Waterproof, spray-on sunscreen is the most hassle-free way to stay protected from the sun’s strong rays. 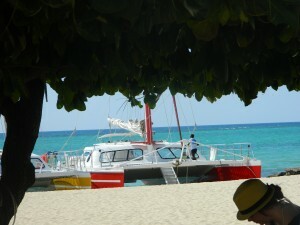 For a gentle introduction to the water world of Jamaica try a catamaran cruise. Head to Cornwall Beach in Montego Bay (MoBay) to board your ride with Dreamer Catamarans. Nonstop music, drinks and a friendly staff will loosen you up before you know it. Foot massages are even offered on board. It’s a most relaxing boat ride, but if you need a little more activity, try the snorkeling or dancing on deck to the likes of ‘The Macarana’. Seas permitting, a stop at Margaritaville MoBay is also very likely. The cost for this fun is around $75.00. 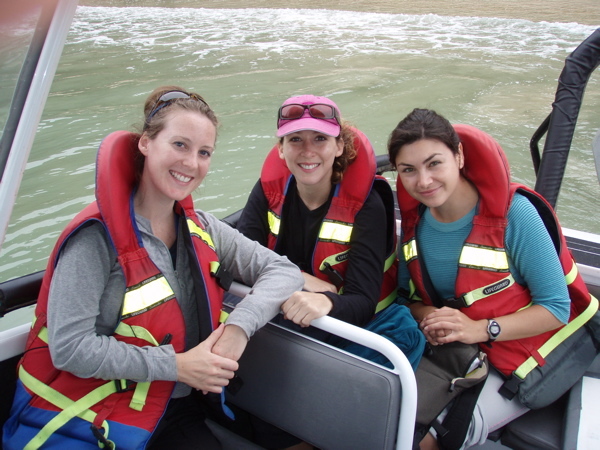 Tip – the seas can get quite bumpy, so if you’re prone to seasickness, seek out some sea-bands. For an experience like no other, swimming with dolphins is hard to beat. You will be delighted by your interaction with the gentle creatures. Dolphin Cove with 2 locations in Jamaica, is the place to get your fix. Not just dolphins will greet you here; they also offer a shark show, a stingray encounter and (somewhat incongruously) a chance to ride a camel. There are 3 levels of dolphin interaction – the ‘touch’ which might include a kiss if you’re lucky, the ‘encounter swim’ in which you’ll actually swim and play with one dolphin, and the ‘swim with’ which is the ultimate…you’ll be pushed and pulled around by 2 dolphins. It’s a little pricey, with rates of around $200 per person based on which level dolphin encounter you choose, but it’s a memory that will stay with you forever. At Chukka Caribbean Sandy Bay there are so many activities to choose from it’s a tough decision to make. Although the ATV and dune buggy rides were appealing, for me the horseback riding was what caught my eye. Never having ridden a horse before I worried that a 2 1/2 hour ride would be too much, but the Chukka folks took care of me. The ride took us on a meandering trail through a wooded area and past a small village and a school. At the end of the ride, it’s optional, but don’t miss the swim portion. 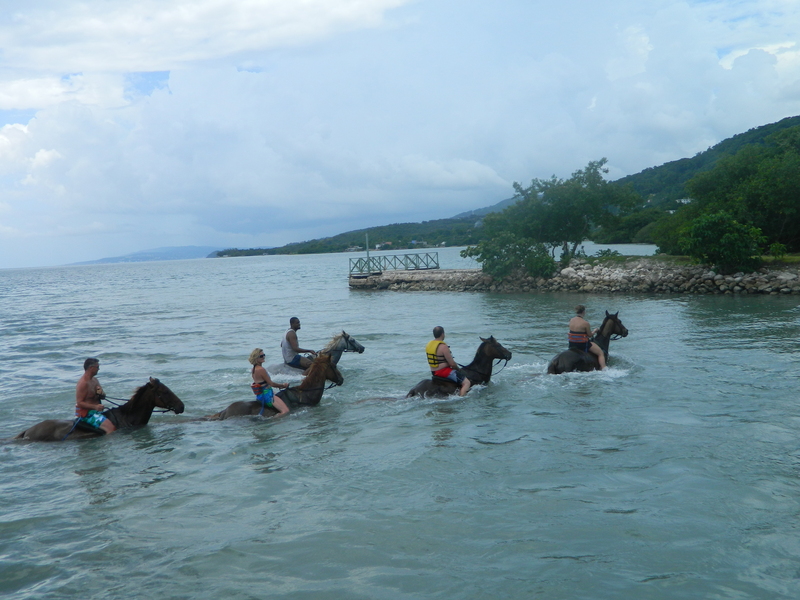 You’ll ride sans saddle right into the ocean and your horse will take a swim with you on it’s back. You will get dirty, so bring a change of clothes and a towel. $74 for a genuinely unique experience is worth it in my book. Tip – For a really good reason, try to be the first horse in the lineup when you hit the water. 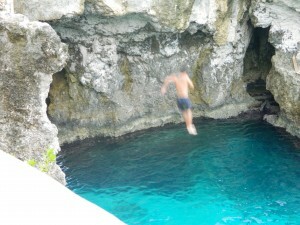 Last but not least, and certainly not for the timid, is cliff diving at Rick’s Cafe. Rick’s in itself is one of those iconic island bars with lots of people and loud music (‘One Love’ seems to play constantly). At one point one of the ‘Top 10 Bars In The World’, Rick’s is a great spot to have a drink and watch the sunset – as well as watch the daredevils catapulting themselves off the edge of the cliff. 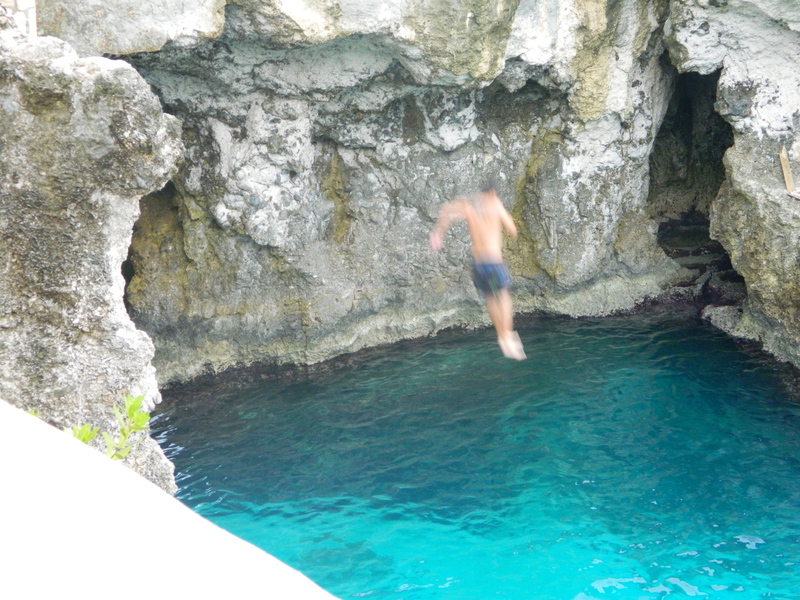 There are various levels of cliff-diving…you can keep it fairly simple by diving a mere 6 feet, or go all out to something like 40 feet or more. The day we were there there was a non-stop line of patrons waiting to risk their life. It is kind of a rite of passage, but beware; injuries have actually been sustained doing this, so use caution if you’re thinking about it. Personally, I was content to sit by the pool with a Red Stripe and enjoy the show. Tip – while it is technically free, the locals milling around to ‘help’ you are expecting a fee for their trouble. Wow, you may have just made up my mind as to where to go for my honeymoon. The way you described each location makes them all sound so amazing. Thanks for sharing such an amazing experience with us. Swimming with the dolphins does sound tempting but the horse ride sounds great! That would truly be an experience well worth it! Kali, It really was a fantastic time. Jamaica is a beautiful island and has a lot to offer outside of the all-inclusive resorts. Enjoy! Wow too cool, you did a great job greatly described all activities. I’m very happy to found this.